Thought to be one of the most powerfully protective crystals in the world, this enchanting crystal suggests there could be a power struggle between two people around you this week. Disagreements between friends, colleagues and family members may leave you feeling very unsettled, and you may find yourself feeling very torn between two people around you too. Protect yourself from their bad vibes and negativity by keeping a Black Tourmaline nearby. Prized for centuries, this stunning crystal is synonymous with the heartbreaking story of a beautiful Greek goddess who was abducted into the Underworld by an evil god! Symbolising love and passion, it suggests you may need to distance yourself from a very manipulative person around you this week. Controlling behaviour from friends and partners may leave you feeling very frustrated, and you may find yourself feeling very drained by someone’s clingy behaviour too. Symbolising love, healing and friendship, this mesmerising crystal suggests there could be a misunderstanding between you and a friend this week. Unanswered messages to friends and loved ones may leave you feeling very annoyed, and you could find yourself feeling slightly threatened by the close bond between two people around you too. Leave your worries behind - and calm your heart and mind - by placing a Turquoise in your home, or keeping one with you each day. Capturing people’s hearts for centuries, this spellbinding crystal suggests you may find yourself mourning the loss or absence of someone you love this week. Deep and meaningful conversations with friends and family members - and dreams about the past - may leave you feeling very nostalgic, and you could find yourself feeling slightly emotional too. Keep your spirits high - and wave your sadness goodbye - by placing a Black Agate by your window or front door. 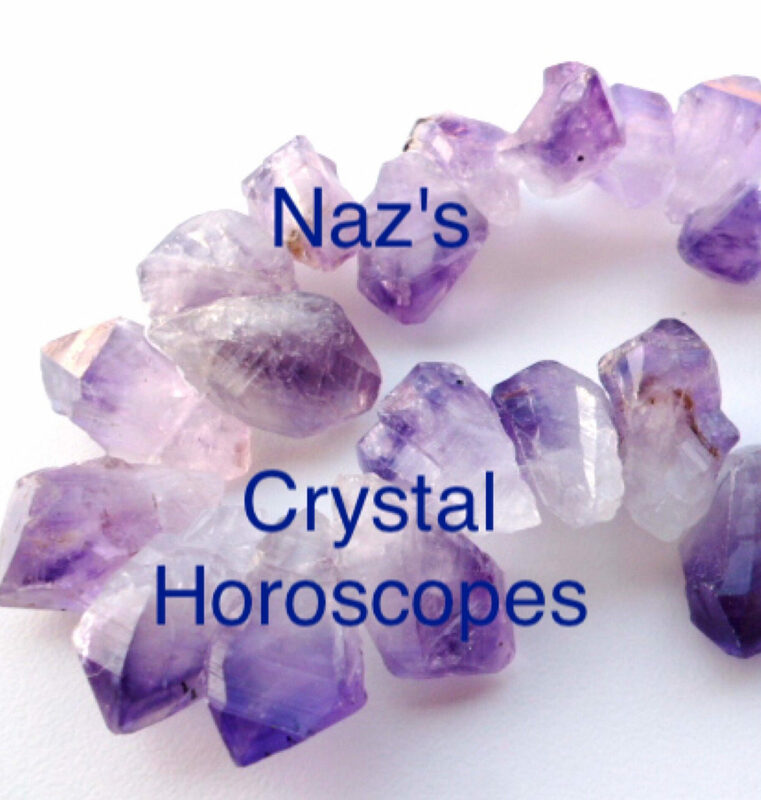 Like the beautiful animal it’s named after - which is renowned for its loyalty - this captivating crystal suggests you may find yourself questioning someone’s words or actions this week. Secretive behaviour from friends, colleagues and family members may leave you feeling slightly unsettled, and a thoughtless comment from a friend or loved one could really play on your mind too. Prevent their negativity from draining your energy by keeping a Dalmatian Jasper nearby. Synonymous with love and healing, this bewitching crystal suggests someone very special from the past could re-enter your life this week. Unexpected messages from ex-partners, childhood friends and long-lost family members may leave you feeling very emotional, and you could hear some shocking gossip about someone around you too! Keep your energy sky high by placing a Moonstone in your home or work place, or simply keeping one with you each day. Enchanting the world with its magical properties for centuries, this beautiful crystal suggests you may need to distance yourself from a very one-sided friendship this week. Ungrateful behaviour from friends, colleagues and family members may leave you feeling very frustrated, and you could find yourself feeling slightly used by someone around you too. Leave their bad vibes and negativity behind you by keeping an Amethyst in your home or work place. Synonymous with the Hawaiian Goddess of Fire and Volcanoes, this mesmerising crystal suggests there could be a fiery exchange between you and a friend, colleague or family member this week. Explosive arguments with friends and colleagues may leave you feeling very tearful, and you may find yourself feeling very misunderstood by the people around you too. Prevent their negativity from leaving you teary by keeping a Peridot nearby. Adorned with bewitching cracks and lines, this beautiful crystal suggests a friend or loved one could ‘break’ the trust between you this week. Two-faced behaviour from friends, colleagues and potential love interests may leave you feeling very angry, and you may need to give someone a piece of your mind too! Leave the bad vibes and drama behind you by keeping a White Howlite in your home or work place, or simply holding one by your heart each night. This beautiful crystal is thought to help with everything - from boosting your confidence and protecting your family, to giving you courage and shielding you from envy! Symbolising courage, it suggests you may find yourself feeling slightly anxious about the future this week. Worries about money - and fears about losing the people you love - may leave you feeling slightly tearful, and you may need to apologise to a friend or loved one for your past behaviour too. Known as a stone of letting go and forgiveness, this mesmerising crystal suggests you may find yourself feeling slightly lonely this week. Disagreements with friends and family members may leave you feeling very low, and you may find yourself feeling very sad about the loss of a friendship too. Fill your heart with peace and positivity - and wash away any negativity - by keeping a Snowflake Obsidian in your home. Prized for centuries, this stunning crystal suggests you may need to reach out to a friend or loved one for their help and support this week. Disagreements with partners and loved ones may leave you feeling very confused, and you may find yourself feeling very frustrated with a very pessimistic person around you too. Protect yourself from their negativity by keeping a Jade crystal in your bedroom, or simply holding one by your heart each night.